The 163rd Infantry Regiment is a regiment of the Montana National Guard. It went overseas with the 41st Infantry Division in World War II. Constituted in the Montana National Guard as the 1st Regiment of Infantry and organized 1884- 1887 from existing companies. Redesignated as the 1st Montana Volunteer Infantry and mustered into federal service 5–10 May 1898 at Helena; served in the Philippines and mustered out 17 October 1899 at San Francisco, Ca. Reorganized 30 May 1901- 1 December 1903 as the 2nd infantry Montana National Guard. Mustered into federal service at Fort William Henry Harrison 27 June 1916 for Mexican border and stationed at Douglas Ar. ; mustered out 3 November 1916 at Fort William H. Harrison. Mustered into federal service 7 April 1917 at Fort William H. Harrison. Consolidated with the 3rd Battalion 3rd Infantry District of Columbia National Guard, Reorganized and redesignated the 163rd Infantry Regiment and assigned to the 41st Infantry Division (United States) 19 September 1917. Demobilized 21 February 1919 at Camp Dix, NJ. Reconstituted as the 2nd Infantry Montana National Guard and reorganized during 1921-1922. 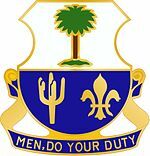 Redesignated as the 163rd Infantry Regiment and assigned to the 41st Infantry Division 1 May 1922. Federally recognized 20 January 1924 with headquarters at Helena. Relieved from the 41st Infantry Division 17 June 1946. Reorganized and federally recognized 21 April 1947 with headquarters at Bozeman. Reorganized and redesignated 1 December 1988 as the 163d Cavalry, a parent regiment under the U.S. Army Regimental System, with Headquarters at Butte, to consist of the 1st and 2nd Battalions and Troop E, elements of the 163d Armored Brigade, and the 163rd Infantry (163rd Infantry - henceforth separate lineage). 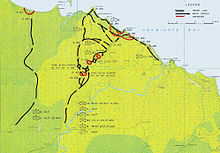 Withdrawn 1 June 1989 from CARS and reorganized under the U.S. Army Regimental System with Headquarters at Butte. A Gold color metal and enamel device 1 1/8 inches (2.86 cm) in height overall consisting of a shield blazoned: Per fess Argent and Azure, in chief a palm tree on a mount Proper and in base a giant cactus and fleur-de-lis Or. Attached below the shield is a Blue scroll doubled and inscribed "MEN, DO YOUR DUTY" in Gold letters. The palm tree represents Philippine service, the giant cactus Mexican Border duty and the fleur-de-lis service in France during World War I. Blue and white are the colors associated with Infantry and refer to the organization’s combat service as the 163d Infantry during World War II. The distinctive unit insignia was originally approved for the 163d Infantry Regiment, Montana National Guard on 8 December 1941. It was redesignated for the 163d Armored Cavalry Regiment, Montana National Guard on 17 September 1953. It was amended to change the symbolism on 21 January 1970. The insignia was updated to include both the Montana and Nevada Army National Guard on 20 January 1975. It was redesignated for the 163d Infantry Regiment, Montana Army National Guard on 1 February 1989. Per fess Argent and Azure, in chief a palm tree on mount Proper and in base a giant cactus and a fleur-de-lis Or. That for the regiments and separate battalions of the Montana Army National Guard: On a wreath of the colors Argent and Azure a fleur-de-lis the middle leaf and tie Or, and outside leaves Argent. Motto: MEN, DO YOUR DUTY. The crest is that of the Montana Army National Guard. ^ McCartney, Wiliam F. (1948). The Jungleers: A History of the 41st Infantry Division. Washington, D.C.: Infantry Journal Press. ISBN 1-4325-8817-6. ^ a b c Milner, Samuel (1972). 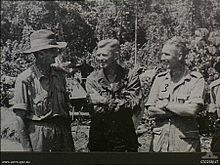 Victory in Papua. Washington, D.C.: United States Army Center of Military History. ^ "Additional copies of this publication may be requested by writing National Guard Bureau, ATTN: NGB-PAH, 2500 Army Pentagon, Washington DC 20310-2500."